Goldenrod has gotten a bad reputation over the years for causing allergies, and hay fever, however, it has been shown that it’s pollen does not go airborne. Rather, it is pollinated by bees and other pollinating insects. 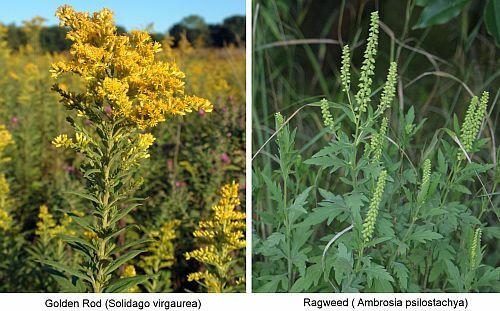 It seems that ragweed, which blooms at the same time of year is actually the culprit for those allergies. Ragweed has inconspicuous flowers which produce a fine dust that goes into the air. Goldenrod has beautiful yellow or golden flower heads. Goldenrod (Solidago virgaurea ) normally grows in open fields and along roadsides, and is a native plant to the U.S. The plant is found from coast to coast in the United States. There are about 20 or so varieties, and each section of the country has it’s own variety from it adapting to the area where it grows. 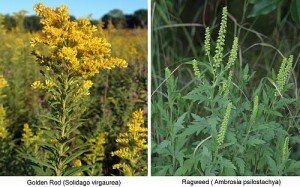 Most all Goldenrod species are found in the Americas. There are a few exceptions, and a few varieties grow in Asia. A very small number of species of Goldenrod have adapted to the cooler climates, and are now growing in Europe. Goldenrod is a perennial herb that grows 20 to 40 inches tall. The flowers are golden yellow, and it’s leaves grow very narrow and have smooth edges. The leaves can actually grow up to 5 or more inches in length. When you crush the leaves, they smell of the herb anise. The flowers are normally in bloom from July through September. It is from the genus of perennial plants of the compositae family. The compositae family comprises about 125 plants. The Canadian (S canadensis) species of goldenrod grow a little bit taller than the U. S. variety, and the leaves are much more pointed and wider. Goldenrod is an herbal diuretic, carminative, diaphoretic, antioxidant, astringent, anti-inflammatory and antifungal. A diuretic is used to eliminate water from the body, a carminative is used to dispel gas, and a diaphoretic is used to make the body sweat. The antifungal properties act specifically against the Candida fungus, but can also be used to treat a fungal infection. The Native Americans have been using goldenrod for centuries. They knew of its medicinal benefits long before the settlers came to America. They used the leaves for gastrointestinal disorders. The flowers were made into a tea and used to treat colic. The flowers were also made into a strong brew to treat disorders of the urinary tract, and also dropsy (edema). Natives used the Canadian species as a poultice for bruises and wounds. Sometimes, a strong infusion was used to wash the wounds before applying the poultice. This helped heal the wound quickly. When the early American colonists decided to rebel against the tyranny of British tea taxes, and dumped all the tea in Boston Harbor, there was now no tea to drink. The colonists took the leaves of the goldenrod plant and made tea from that. The tea was later dubbed “Liberty Tea”. The goldenrod leaf tea was very tasty, and became so popular, in later years the colonists started exporting it to China. 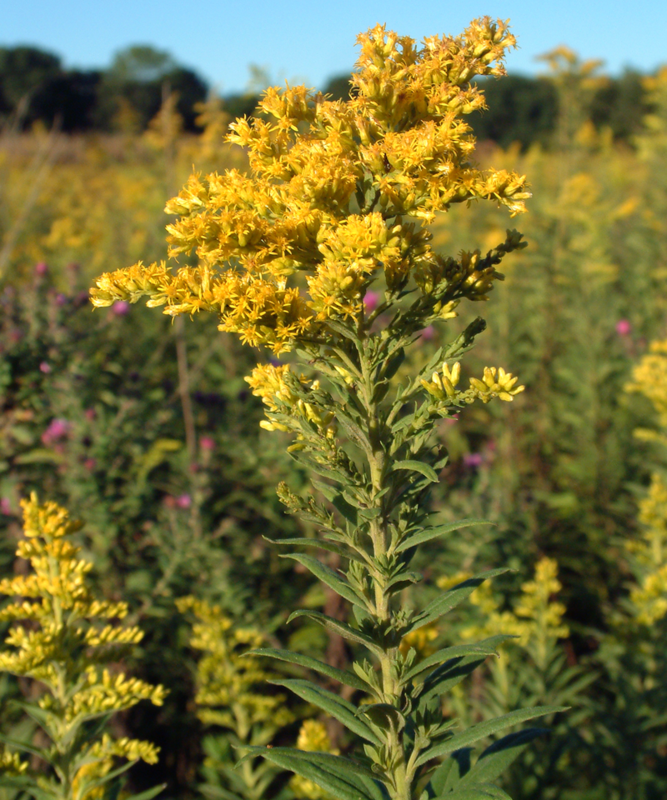 Today, herbalists use goldenrod much in the same way the Native Americans did. It is used to alleviate gastrointestinal issues, such as gas and bloating, as well as to promote sweating to help break a fever during a cold or flu. It is also used to help treat kidney stones. It helps to break down the stones in the urinary tract. Goldenrod oil can be used to help reduce pain and swelling and to help stop muscle spasms. It can be used on overworked muscles to help calm them. Infuse the flower heads into oil, and let sit for 6-8 weeks. Strain and bottle. It can be mixed with other herbs such as willow bark, comfrey, or arnica for their healing benefits. It can be beneficial for conditions such as arthritis, bursitis, rheumatism and fibromyalgia. Fiber artists who work with sheep wool , or other animal fibers, as well as textile fiber artists can use the flowers of the goldenrod plant as a natural dye. It turns the wool an off golden to brownish color depending on the mordant that is used. The flours can be dried and ground into a 50 / 50 mix with white or whole wheat flower. The blossoms can also be fried up in a light batter and eaten as fritters. Goldenrod oil can be beneficial to eczema and psoriasis. If you are allergic, you should stay clear of using this herb. If you have heart issues, or high blood pressure, it is best to avoid. Don’t take with other diuretic medications. This can lead to the body losing too much water. This article is not meant to diagnose, or treat any illness. It is meant for educational purposes only. Be sure to check with your doctor to see if taking a herbal remedy is right for you. While herbs are natural, they are medicine, and should be treated that way. More does not equal better or faster results. Herbs and herbal remedies can have interactions with certain medications, other herbs, and even foods.